Fill a medium saucepan halfway with water, and set over medium heat – allow to come to a boil while preparing the chicken and sauce (once it comes to a bowl, set to a low simmer until ready to cook the pasta). Set a chicken breast atop a large cutting board – cover with a single layer of plastic wrap. Using a meat mailet, flatten to about 1/2-inch thick. Set aside, and repeat with remaining chicken pieces. Mix flour, salt, and pepper together on a large plate. Dredge flattened chicken breasts in flour mixture. Heat olive oil and butter together in a medium skillet over medium heat. When butter is melted and oil/butter mixture is hot, fry two chicken breasts until nice and golden brown on each side, about 2 to 3 minutes per side. Remove chicken breasts from the skillet and keep warm; repeat with remaining chicken breasts. Set aside once done. Without cleaning skillet, add onions and garlic and gently stir for 2 minutes. Pour in wine and scrape the bottom of the pan, getting all the flavorful bits off the bottom. Allow wine to cook down until reduced by half, about 2 minutes. (Optional) Remove the onion-garlic mixture from the pan, and place into a food processor – process until ground to a fine pasta. Return to the pan and sauté for a minute or so. Pour in tomatoes and stir to combine. Add the sugar and more salt and pepper to taste. Allow to cook for about 15 minutes. Meanwhile, add the pasta to the already boiling pot – cook until al dent (will vary according to pasta and pan size. Read the instructions on your pasta’s package). Add the parsley, and stir until just mixed. 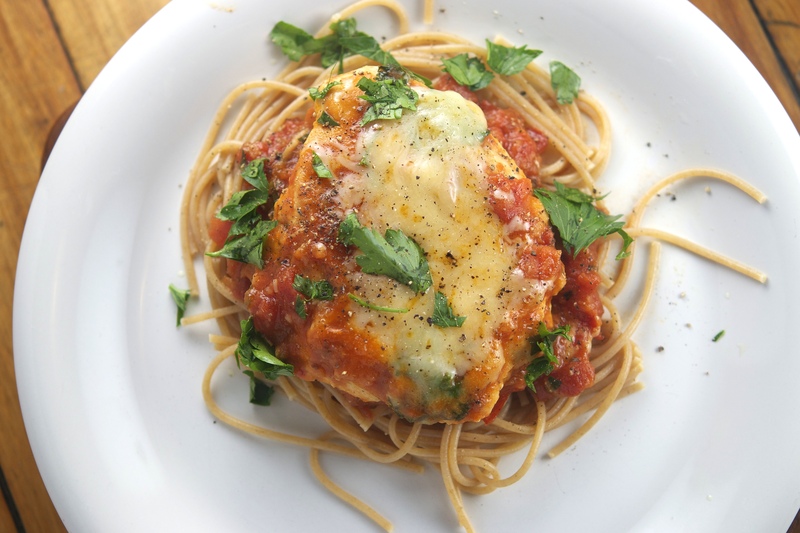 Carefully nestle chicken breasts on top of the sauce – cook for about 5 minutes, then completely cover them in grated Parmesan. Place the lid on top of the skillet, and reduce heat to low. Allow to simmer until the cheese is just melted and the chicken is thoroughly heated. Add more cheese to taste, if desired. Pile cooked pasta onto a plate and cover with sauce. Place one chicken breast on top, and sprinkle with more parsley. Serve immediately.